What Does the ADT Portal do for You? So you've just installed your ADT Pulse System or you are about to make the investment and you want to know exactly what the ADT Pulse portal will do for you. Well get prepared for massive awesomeness! What has got to be the best part of your personalized web portal is how it guides you through the process and continues to make suggestions on how to get the most out of your system. Not like a set up wizard that does a basic set up for you (although it does do that too!) but suggestions on the side bar to make your system do the hard lifting for you. Say you log in to inspect your videos religiously. It might propose the ides of having text and email notifications automatically sent to you for all surveillance events. It will logically also present you with a link in case you need info on how to do that. Your ADT Pulse Log-in Opens a Whole New World of Home Security and Home Automation.. The first thing you will notice upon log in is the it looks simple. And it is! One of the most commented upon benefits of investing in an ADT Pulse system is that it is straight forward and easy to use. Your first screen is the "Summary" screen. it's exactly that, a summary of what's going on in your home. First you will see an over sized icon that is color coded to show the status of your home. Big green circle means the system is currently disarmed, Big red circle means the system is armed. Easy - Peasy. simply click the button that says arm to arm the system or disarm to disarm. Below that you'll find an overview of other devices. Here you can see the status of individual cameras, thermostats and more. A bit further down is a list of notable events. See at a glance what has been happening. See if a battery is low or a sensor was tampered with. The right hand column has your home view (once you set it up.) This is a basic outline of your home and rooms with device icons actually where they are in your home and the status of each. So you have a list view of devices and a more visual view of devices. Clicking on a device in either view allows you to interact with that specific device right from the summary screen. Below the home view you'll find views from your camera. Again, click on any one to go into the live feed right from the summary screen. Below the camera feeds is a list of any scheduled events you have set up for today. The history tab lists all the events that have affected all of the devices in your home. To help you easily find a specific event, you can use the pull down menu to see just the events on a specific device. The alerts tab lists all of the text and email alerts you have set up to be sent. You will also add new alerts and edit alerts on this tab. Alerts are text or email messages that "alert" you of what's going on at home. It could be to let you know the kids did or did not arrive home on time from school or that motions was sensed on the front door camera. You can even attach a video clip for confirmation. Learn how to set up alerts with ADT Pulse here. The automations tab lists all of the automations you have set up. You will also set-up new automations and edit existing automation on this tab. Automations are events that happen automatically due to some other event or situation. For example, you might want your thermostat to heat to 68 degrees any time it falls below 67 degrees. Or you might want all doors to lock and the thermostat to set itself to 60 degrees when you arm the security system to away. Once the automations are set up in this tab, they will happen every time your parameters are met. Much like the alerts and automations tabs, the schedules tab lists all of the schedules you have set up. You will also set-up new schedules and edit existing schedules on this tab. Schedules are events that happen on a schedule. You can schedule exterior lights to come on every day at 6pm or the thermostat to turn off every weekday from 8am to 4pm and then heat to 70 degrees. There is also a random option. If we wanted a vacant house to look lived in, schedule for the lights to turn on at random times between certain hours. Your systems tab is where you will set up users and preferences. You also set the email and mobile device phone numbers here that will receive alerts that you set up in your alerts tab. You will find a list of your devices here and have the ability to add new devices yourself. Also here are the site setting, users, access codes, profile history and modes. The modes tabs allows you to name your modes. Modes allow multiple actions to occur just by setting a mode. For example, you might have a vacation mode that locks all door locks, has a randomized light and television schedule, a lower thermostat level and automatically arm the system to away and have the surveillance system alert you every time someone comes on your front porch and attach a video clip so you can see who it is. You would name one of your customizable modes "vacation" and then set up the scheduled events, automations and alerts that you would like to have associated with this mode in the appropriate tabs. You set it up one time and then vacation mode is one click away at any time. For step by step instructions to set up modes go here. Now I am sure you would like to be able to do some of these things on the go. Don't worry, there's an app for that. The ADT Pulse app offers many of the same features for your mobile device. While the actual set up of automations, scheduled, alerts and modes is done in the Web Portal, control of all your devices and the ability to check statuses as well as check what automations, schedules and alerts are already set up is possible from any mobile device by use of the app. Activate a mode or arm/disarm your entire system from your mobile device. The latest update even integrates voice commands to offer you a hands free experience. 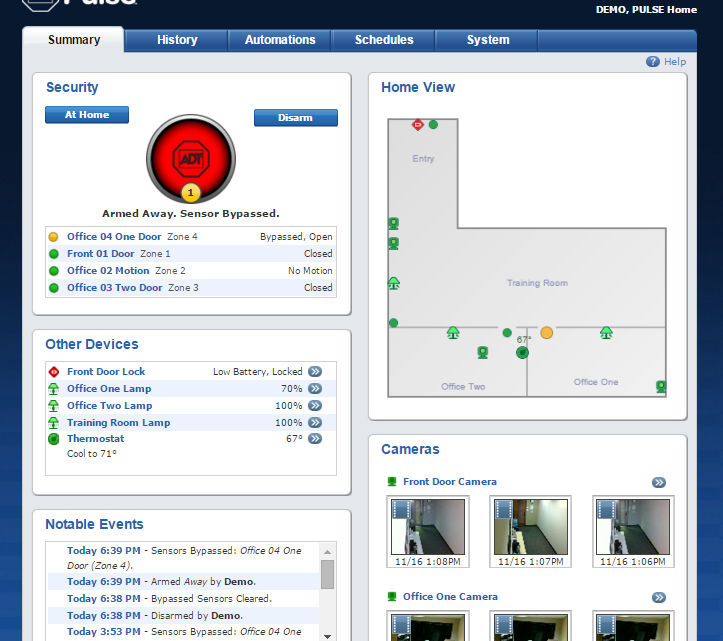 As you can see, your customizable web portal is your complete command center for your ADT Pulse system. What might be equally important for you is the mobile aspect. Together, your home is a well oiled machine that keeps you completely in control of your home. If you have not yet ordered your ADT Pulse system, set up a FREE security review today. Setting up text and email alerts with ADT Pulse. - Learn how to tie in a text or email alert letting you know exactly when an event happens and more importantly, giving you real time data so you can respond appropriately.